The Hudson Valley Railway was formed in 1901 as the result of the consolidation of the Warren County Railway, Stillwater and Mechanicville Street Railway Company, Greenwich and Schuylerville Electric Railroad, Saratoga Traction Company, Saratoga Northern Railway, and the Glens Falls, Sandy Hill, and Ft. Edward Street Railroad Company. It provided trolley service to Warrensburg from January of 1902 through December of 1927. Addison Colvin was the first president and Thomas O'Connor, secretary. The trolley line paralleled Route 9 from Lake George (much still visible today), crossing the Schroon on a bridge adjacent to the plank road bridge and ran up the west side of Main Street to the terminus at Adirondack Avenue. A "Y" turnaround track ran adjacent to the New Adirondack Garage building. (Now parking for the building housing Warrensburg Laundry.) Electric power was provided by a company-owned generating plant on River Street utilizing the Woolen Mill dam. A yellow maintenance car was nicknamed "the Yellow Kid" after a popular cartoon character of the day in a strip called Hogan's Alley by Mickey Dugan. A 1923 timetable lists ten departures from Warrensburg daily to as far as Troy, Albany and Schenectady, with "additional service on weekends, as traffic demanded." The round-trip fare from Warrensburg to Schenectady was $3.00. As in much of America, the trolley line succumbed to competition from the automobile and buses. Stage Coach Lines. There were four stage lines in and out of Warrensburgh. 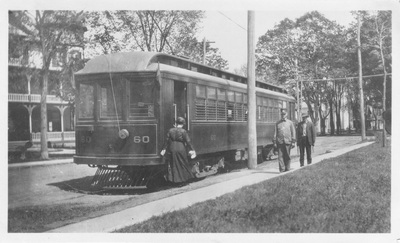 The Blue Line, owned by George T. Lockwood, connected Warrensburgh to Thurman Station. It took fifty-five minutes. The Glens Falls stage, owned by Roswell B. Kenyon took you to the Lake George Station in 90 minutes, where you could get a train connection to Glens Falls. In 1895 Roswell B. Kenyon (1852-1921) abandoned his stage line between Warrensburg and Glens Falls and engaged with the Hudson Valley Railway Company to deliver freight and express matter for the trolley line in Warrensburg and surrounding area. In 1915 he purchased a two-ton Garford auto truck from the Adirondack Garage. He made two trips a day between Warrensburg and Glens Falls. Roswell was married to Rachael Cole.